A debut novel can be the purest glimpse into the mind of a writer. Before becoming saddled with the weight of expectation and an awareness of having to live up to what came before, the debut can seem like an unshackled, carefree, gleefully un-self-conscious thing. Boxer, Beetle is like this. It reads like Beauman had a head full of ideas, and decided to find a way to fit as many of them into the novel as he possibly could. 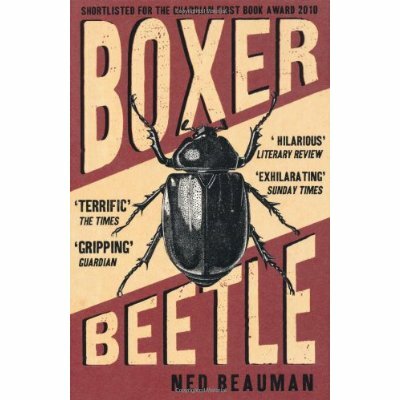 Boxing, entomology, Nazi’s; it shouldn’t really fit together as well as it does. The story is of a modern-day Nazi memorabilia collector and the trouble he manages to get caught up in, told alongside the story of what happened back in the 1930’s. The 1930’s chapters are like little archaeological digs that reveal the secrets being slowly uncovered in the modern-day chapters. It has a large cast of characters, and at times it is not always clear who we ought to be rooting for. They are flawed and despicable some of the time, human and sympathetic at others. The book, like its plot, manages to be many things at once. It is clever, funny, thoughtful. What really comes through is how much fun Beauman must have had while writing it, hurling ideas at the page. He writes with great flourishes and gigantic sentences that seem like they won’t ever end. But I didn’t get the impression that this was because Beauman is a naive or undisciplined writer, more that for all the benefits there are to following the rules, sometimes you can just chuck the rule-book away and do whatever the hell you like. Writing, after all, allows you to conjure up whatever you want simply by putting the words down on the page. So why not just go nuts and have a great time doing it? If you want a protagonist with a weird medical condition you can have one. If you want a violent, nihilistic, homosexual boxer, you can have that too.